A PROFINET Component Based Automation (CBA) system consists of various automation components. One component covers all mechanical, electrical and IT variables. The component can be generated using the standard programming tools. A component is described using a PROFINET component description (PCD) file in XML. A planning tool loads these descriptions and enables the logical interconnections between the individual components to be generated for implementing a plant. This model was largely inspired by the IEC 61499 standard. The basic idea of CBA is that an entire automation system can be divided into autonomously operating subsystems. The design and the functions can end up in identical or slightly modified form in several systems. Each component is usually controlled by manageable number of input signals. Within the component, a control program executes the function and passes the corresponding output signals to another controller. The engineering that is associated with it is manufacturer-neutral. The communication of a component-based system is only configured, instead of being programmed. The communication with PROFINET CBA (without real time) is suitable for bus cycle times of approx. 50 to 100 ms. The parallel running RT channel allows for data cycles similar to PROFINET IO (a few ms). Interfacing to peripherals is implemented by PROFINET IO. It defines the communication with field connected peripheral devices. Its basis is a cascading real-time concept. PROFINET IO defines the entire data exchange between controllers (devices with “master functionality”) and the devices (devices with “slave functionality”), as well as parameter setting and diagnosis. PROFINET IO is designed for the fast data exchange between Ethernet-based field devices and follows the provider-consumer model. Field devices in a subordinate PROFIBUS line can be integrated in the PROFINET IO system without any effort and seamlessly via an IO-Proxy (representative of a subordinate bus system). A device developer can implement PROFINET IO with any commercially available Ethernet controller. It is well-suited for the data exchange with bus cycle times of a few ms.The configuration of an IO-System has been kept similar to PROFIBUS. PROFINET IO always contains the real-time concept. The IO Device, which is a field device, monitored and controlled by an IO Controller. An IO Device may consist of several modules and sub-modules. The IO Supervisor is softwaretypically based on a PC for setting parameters and diagnosing individual IO Devices. An Application Relation (AR) is established between an IO Controller and an IO Device. These ARs are used to define Communication Relations (CR) with different characteristics for the transfer of parameters, cyclic exchange of data and handling of alarms. Refer to PROFNET IO connection life-cycle for a more detailed description. The characteristics of an IO Device are described by the device manufacturer in a General Station Description (GSD) file. The language used for this purpose is the GSDML (GSD Markup Language) – an XML based language. The GSD file provides the supervision software with a basis for planning the configuration of a PROFINET IO system. Because PROFINET uses TCP/IP a MAC and IP address are used. A MAC address changes if the device is replaced. An IP address is a form of dynamic addressing. Because there was a need for a fixed address a device name is used. Within PROFINET IO, process data and alarms are always transmitted in real time (RT). Real time in PROFINET is based on definitions of IEEE and IEC, which allow for only a limited time for execution of real-time services within a bus cycle. The RT communication represents the basis for the data exchange for PROFINET IO. Real-time data are treated with a higher priority than TCP(UDP)/IP data. RT provides the basis for the real-time communication in the area of distributed periphery and for the PROFINET component model. This type of data exchange allows bus cycle times in the range of a few hundred microseconds. Isochronous data exchange with PROFINET is defined in the isochronous real-time (IRT) concept. Devices with IRT functionality have switch ports integrated in the field device. They can be based e.g., on the Ethernet controllers ERTEC 400/200. The data exchange cycles are usually in the range of a few hundred microseconds up to a few milliseconds. The difference to real-time communication is essentially the high degree of determinism, so that the start of a bus cycle is maintained with high precision. The start of a bus cycle can deviate up to 1 µs (jitter). IRT is required, for example, for motion control applications (positioning control processes). Profiles are pre-defined configurations of the functions and features available from PROFINET for use in specific devices or applications. They are specified by PI working groups and published by PI. Profiles are important for openness, interoperability and interchangeability, so that the end user can be sure that similar equipments from different vendors perform in a standardised way. There are PROFINET profiles for encoders, for example. Other profiles have been specified for motion control (PROFIdrive) and Functional Safety (PROFIsafe). A special profile for trains also exists. Another profile is PROFIenergy which includes services for real time monitoring of energy demand. This was requested in 2009 by the AIDA group of German automotive Manufacturers (Audi, BMW, Mercedes-Benz, Porsche and VW) who wished to have a standardised way of actively managing energy usage in their plants. High energy devices and sub-systems such as robots, lasers and even paint lines are the target for this profile, which will help reduce a plant’s energy costs by intelligently switching the devices into ‘sleep’ modes to take account of production breaks, both foreseen (e.g. weekends and shut-downs) and unforeseen (e.g. breakdowns). 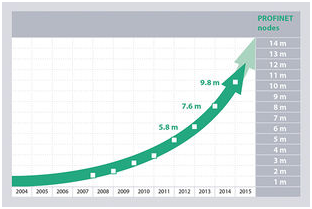 PROFINET is defined by PROFIBUS and PROFINET International (PI) and backed by the INTERBUS Club and, since 2004, is part of the IEC 61158 and IEC 61784 standards.